Have left Dunedin for the warmer north, and am visiting my sister in Auckland for a couple of days. While I’m here I thought I’d do a bit more of Te Araroa – the Coast to Coast walkway. This goes from the ferry terminal in the heart of the CBD to Manukau Harbour; about 16 km in all. A relatively easy day. Heading out of the immediate shopping frenzy of Queen Street and the surrounding environs (including the spectacular Sky Tower, the tallest man-made building in New Zealand) I made my way up to the Auckland Domain. This is a multipurpose green space in the centre of the city, and lots of people were out enjoying it. The Auckland Museum is in the middle of the Domain, so I abandoned the walkway for a couple of hours to troll through it. They had dinosaurs! I was so excited. I could stare at dinosaur skeletons for hours. 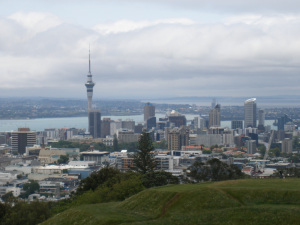 After lunch at the Museum cafe, I headed across to Mount Eden, and hauled myself up to the crater. I’ve been there a couple of times before, and always enjoy going. Mostly because, I admit, it caught my imagination as a young child, when I was reading Maurice Gee’s Under the Mountain, in which a red-headed twin throws a magic stone into the crater, thus bringing about the downfall of evil, quacking aliens called Wilberforces, who want to turn the entire Earth to mud. It’s better than I’m making it sound, truly. I loved that book. An hour or so later I was doing the same thing at One Tree Hill (minus the sci-fi reminiscences of my childhood). 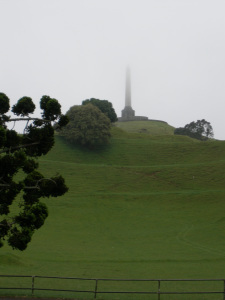 One Tree Hill is a complete misnomer, I’m afraid. Firstly, because it’s lower slopes are covered with a lot more than a single tree. And secondly, because although it once had a single tree at the top, as far as I recall someone threw a tantrum and cut it down, so now there’s no tree at all. Grrrr. I’m a botanist at heart, and chopping down trees for the hell of it really pisses me off. From OTH I trotted towards the end point, Onehunga Bay Reserve, a small park on the edge of Manukau Harbour and the end of the trail. A really good day, on a very well-done trail. I especially liked how as much of the walk as possible was through green spaces – it wasn’t just trekking through roads and obviously urban environments, which would have been easy to do. Got quite sunburnt, though. Must make sure not to forget my sunscreen again!